References getPage(), AP_Dialog_Options::id_CHECK_AUTO_LOAD_PLUGINS, AP_Dialog_Options::id_CHECK_AUTO_SAVE_FILE, AP_Dialog_Options::id_CHECK_CUSTOM_SMART_QUOTES, AP_Dialog_Options::id_CHECK_ENABLE_OVERWRITE, AP_Dialog_Options::id_CHECK_GRAMMAR_CHECK, AP_Dialog_Options::id_CHECK_LANG_WITH_KEYBOARD, AP_Dialog_Options::id_CHECK_OTHER_DEFAULT_DIRECTION_RTL, AP_Dialog_Options::id_CHECK_SMART_QUOTES_ENABLE, AP_Dialog_Options::id_CHECK_SPELL_CHECK_AS_TYPE, AP_Dialog_Options::id_CHECK_SPELL_HIDE_ERRORS, AP_Dialog_Options::id_CHECK_SPELL_MAIN_ONLY, AP_Dialog_Options::id_CHECK_SPELL_NUMBERS, AP_Dialog_Options::id_CHECK_SPELL_SUGGEST, AP_Dialog_Options::id_CHECK_SPELL_UPPERCASE, PG_DOCUMENT, PG_GENERAL, PG_SMARTQUOTES, and PG_SPELL. References XAP_Win32DialogBase::getDlgItemText(), getPage(), UT_UTF8String::utf8_str(), and UT_Win32LocaleString::utf8_str(). References UT_Language::getNthLangCode(), getPage(), and m_curLang. References _controlEnable(), AP_Dialog_Options::_gatherLanguageWithKeyboard(), AP_Dialog_Options::id_CHECK_DIR_MARKER_AFTER_CLOSING_PARENTHESIS, and AP_Dialog_Options::id_CHECK_LANG_WITH_KEYBOARD. References UT_String::c_str(), getPage(), and XAP_Win32DialogBase::setDlgItemText(). References UT_String::c_str(), UT_Language::getIndxFromCode(), getPage(), m_curLang, and UT_String::size(). References _gatherUILanguage(), m_curLang, and m_langchanged. References XAP_Win32PropertyPage::getHandle(), m_document, m_general, m_smartquotes, m_spelling, PG_DOCUMENT, PG_GENERAL, PG_SMARTQUOTES, PG_SPELL, and UT_ASSERT_HARMLESS. Referenced by _controlEnable(), _gatherAutoSaveFileExt(), _gatherAutoSaveFilePeriod(), _gatherInnerQuoteStyle(), _gatherOuterQuoteStyle(), _gatherUILanguage(), AP_Win32Dialog_Options_Sheet::_onCommand(), _setAutoSaveFileExt(), _setAutoSaveFilePeriod(), _setInnerQuoteStyle(), _setOuterQuoteStyle(), and _setUILanguage(). References AP_Dialog_Options::a_OK, XAP_Win32PropertySheet::addPage(), UT_Win32LocaleString::c_str(), XAP_Win32PropertyPage::createPage(), UT_Win32LocaleString::fromUTF8(), XAP_Dialog::getApp(), XAP_App::getStringSet(), XAP_StringSet::getValue(), AP_Dialog_Options::m_answer, m_document, m_general, m_langchanged, XAP_Dialog::m_pApp, AP_Dialog_Options::m_pFrame, m_smartquotes, m_spelling, XAP_Win32PropertySheet::runModal(), XAP_Win32PropertySheet::setApplyButton(), AP_Win32Dialog_Options_SmartQuotes::setContainer(), AP_Win32Dialog_Options_Spelling::setContainer(), AP_Win32Dialog_Options_Document::setContainer(), AP_Win32Dialog_Options_General::setContainer(), AP_Win32Dialog_Options_Sheet::setParent(), and UT_return_if_fail. Referenced by _gatherUILanguage(), _setUILanguage(), and checkLanguageChange(). Referenced by getPage(), and runModal(). 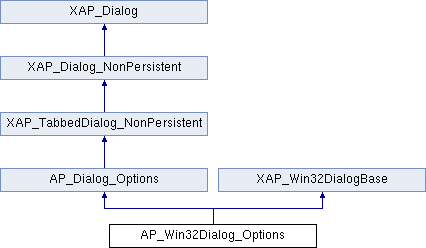 Referenced by AP_Win32Dialog_Options(), and ~AP_Win32Dialog_Options(). Referenced by AP_Win32Dialog_Options(), checkLanguageChange(), and runModal().